For those of you who have yet to experience the gustatory joy that is Ethiopian cuisine, this spot provides one of the finest examples of the style that we’ve found in the city. If you’re new to the genre, order one vegetarian sample and one meat sampler in order to receive a well-rounded mix of wot (spicy) and alecha (mild) items. 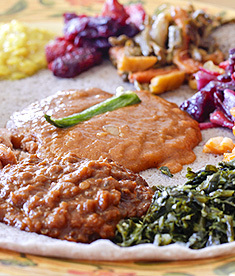 Use the spongy injera bread as your utensil to scoop bundles of food into your mouth.